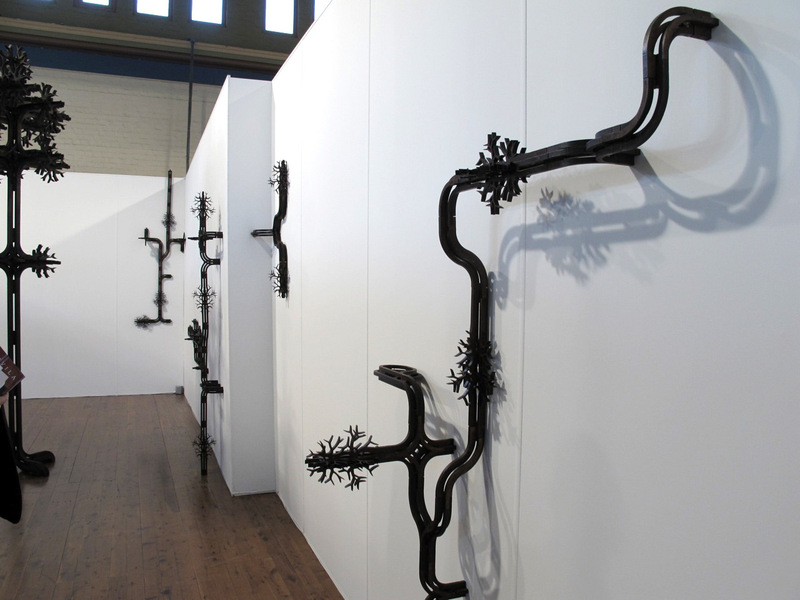 Simeon Nelson, Paratekton series, installation view, Mossgreen Gallery, 2010 Melbourne Art Fair. A trip to Brisbane has yielded the first show to be given the honour of classification under “The Bad” on The Post Post! (Don’t forget that here, the bad is the best ala Michael Jackson’s, “Who’s Bad?”, before he went ummm… actually really bad.) Who woulda thunk it? We Sydney-siders don’t tend to look North for artistic inspiration. Instead, we gaze longingly overseas, while also keeping a wary eye on Melbourne, still miffed by the age old rivalry that continues to rage on a very slow burn between the two cities. Bris-Vegas (as we somewhat condescendingly call it) is barely on our radar except when the Asia Pacific Triennial makes such a big blip that even the solipsistic citizens of Sydney can’t ignore it. So my expectations in Brisbane were low and I was pleasantly surprised. Of course this is not a coincidence. As I keep saying, over and over, low expectations are the key to satisfying gallery trawling. But nevertheless, in one day, I visited two public and three commercial galleries in Brisbane and I didn’t hate anything. In fact I liked all the exhibitions! It may have just been the warm tropical breezes going to my head, but it’s been a long time since I could say that in Sydney. The works in Simeon Nelson’s exhibition, Systems of Romance II, are complex but not complicated. And this too may be one of the secrets of success. Nelson follows a simple formula to produce stunning results. In his Paratekton Series, Henry Ford style mass production meets Ikea’s genius for flat-pack units able to be assembled in multiple configurations. Nelson’s sculptures are a classic nature meets culture clash. 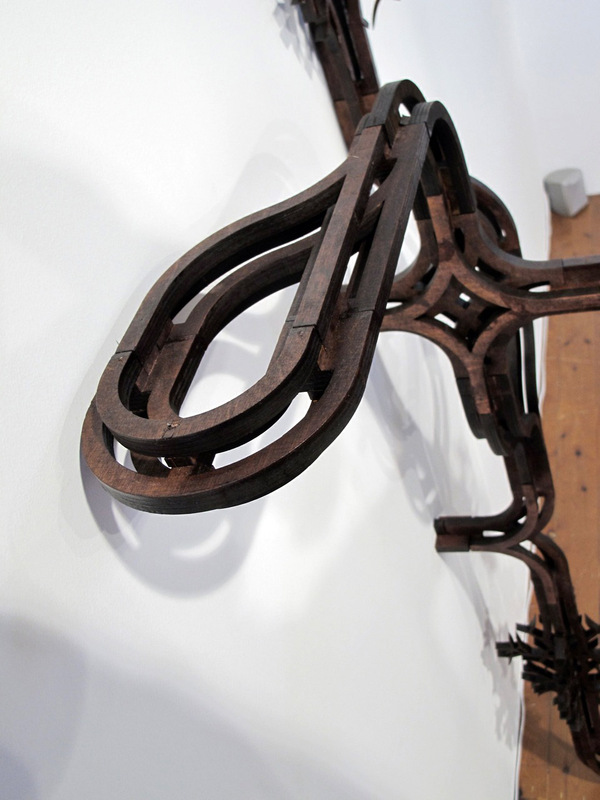 The smooth racing loops of his mechanical structures, which resemble model train-tracks made from wood or miniature versions of LA-esque freeways, are interrupted by sudden decorative bursts of highly stylised organic forms. The artist himself describes the work as “Scalectrix for grownups designed by Augustus Pugin”, which is exactly what I would have said if I’d had the name of the 19th century neo gothic architect on the tip of my tongue. Simeon Nelson: Systems of Romance II is on until September 4, 2010 at Ryan Renshaw Gallery, 137 Warry Street, Fortitude Valley, Qld. hey, my pleasure. Nice to finally see something so good it’s “bad”! these pieces make me think of odd shaped black cacti, scattered willy nilly in an american desert, which have some how attracted cow boy boot spurs to them.